I rarely fly with our national flag carrier. Quite a shame for me. But I believe, my fellow budget travelers can understand my sentiments. Everything boils down to the basic reason, IT IS EXPENSIVE. Philippine Airlines (PAL) is like the iPhone in the local airline industry. While all other competitors are making all means to offer the cheapest flight, PAL never joined the bandwagon. It never showed signs of being affected and alarmed by that demand principle that buyers always favour the cheaper alternative. My second PAL flight was sponsored by the workplace so I never felt the pain of paying. I checked the cost and was surprised to see the fare that can already afford a regular trip to Davao (way farther than Palawan) or a promo fare to Hong Kong / Macau via Cebu Pacific. If I were to go to Puerto Princesa on my own, my budget will surely refuse the cost of a PAL flight. 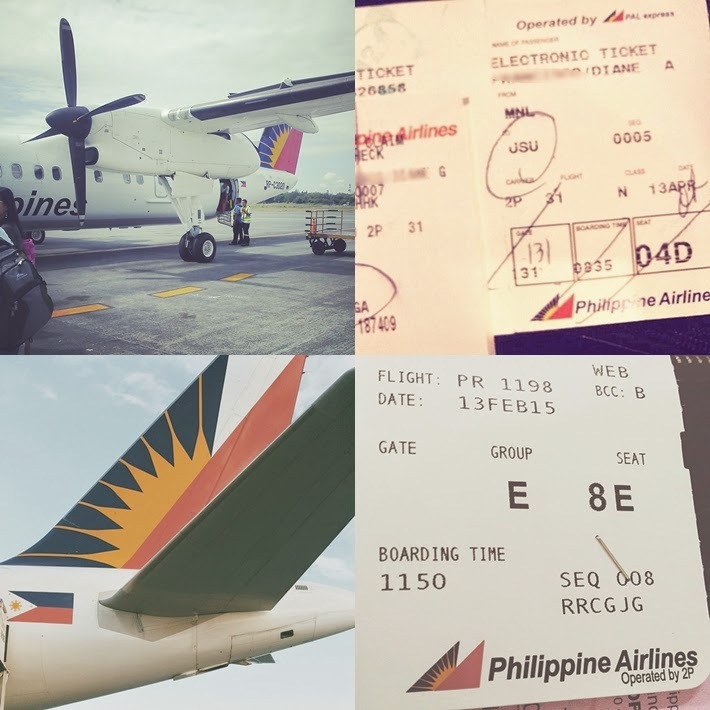 While I always adhere to the idea that the best services come in a hefty price tag, I conditioned myself that this will be my experience with PAL. Question is, did it happen with my two PAL flights? To establish my own conclusion, let me recount my notable experiences. 2. Customer Service inside the flight - I'm still confused. Or maybe, I had the same level of sentiments with PAL and Cebu Pacific. On my flight to Puerto Princesa, the cabin crew failed to hand my complimentary snacks. lol The snacks that wasn't served is not my issue though. It's the mistake of not ensuring that all passengers are served. Anyway, I have a hidden bag of Krispy Kreme doughnuts, which was way better than the Fudgee bar they serve. Hahaha On the way home however, I was rather impressed with a male cabin crew who made some unexpected initiative. A few minutes after our snacks were served, he carried a huge bottle of distilled water and plastic cups. He made rounds and offered a glass of water to all passengers. A few years ago, I remember experiencing a not-so-good customer service experience with another airline, Cebu Pacific. On the way home, another female passenger occupied my designated seat. Pet peeve! Given that I paid for a window seat in one of the front rows, there's no way I would compromise. I sought the assistance of the cabin crew only to end up doing things on my own. I dealt with two rude passengers who even forced me to do some acrobatic moves in the limited seat spaces. 3. Cleanliness Issues - I was quite disappointed with my flight back to Manila with PAL. I noticed crumbs of bread on my seat. The trash even extended to the seat's pocket that usually contain the printed safety guideline kit. I don't know if this is still the responsibility of the cabin crew or totally the fault of another inconsiderate passenger. 4. Presence of Airsickness Bag - I don't know the CAAP's ruling for this. Should all seats be provided with this small yet life saving paper bag? In my past flights via Cebu Pacific, I noticed that the provision of airsickness bag on my seat and to my nearby fellow passengers. In my last flight from PAL, nothing was inserted in our seat pockets. Or maybe, airlines don't really follow this rules on domestic flights? They tend to be more compliant only on international flights, which is the case for all my Cebu Pacific flights. 5. Delayed flights - Although I believe that this is not entirely the fault of the local airline industry. The government has to perform its function of increasing the perimeter of our airports. Cebu Pacific has always been equated to delayed flights. To be fair with the company, I only experience a major flight delay once. Unfortunately, that rare time was almost traumatic. I was stuck in the airport for more than 3 hours!!! In the case of PAL, I experienced an anticipated delay. Days before the trip, we were informed that our departure from Manila will be rescheduled four hours after. Still counts as a major flight delay, but the advanced notice somehow lessened my level of dissatisfaction. At this point, I have to say that our national flag carrier has not given me a highly impressive experience. Or maybe, I should not expect anything because I only availed their economy flight. There are little things that surprised me but there are little imperfections as well. I will not however deny that I feel a certain prestige on those rare times I fly with our national airline. Haven't had an issue with PAL yet. I flew via PAL just three or four times I think. But one good thing is I don't have to pay for the plane ticket. My father works there and we (his family) is free to fly for a lifetime. Well, not until we sisters get married though. Haha. If I'm to compare our two prime carriers, I'd go with PAL hands down. I remember being tatanga-tanga in San Francisco and late(!!! seriously, kelan ako hindi late???) in getting my ticket. The PAL ground crew was already closing the counter, and yet, she gave me my ticket and let me board my flight. To save time, they just let me carry my stuff, but my Swiss knife was with my carryon. Since bawal yun, they just gave it to the pilot for safekeeping (instead of asking me to dump it) and returned it to me before disembarkation. How's that for quality service? And like my sentiments in my blog, their crew is really head and shoulders above their CebuPac counterparts, in manner, bearing, and professionalism. Beautiful Sunday # 145 Rush! Rush!